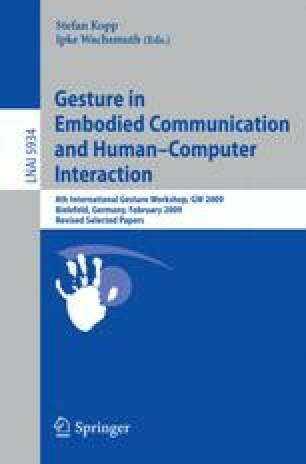 This paper proposes a gesture-based approach to user interface sound design, which utilises projections of body movements in sounds as meaningful attributions. The approach is founded on embodied conceptualisation of human cognition and it is justified through a literature review on the subject of interpersonal action understanding. According to the resulting hypothesis, stereotypical gestural cues, which correlate with, e.g., a certain communicative intention, represent specific non-linguistic meanings. Based on this theoretical framework, a model of a process is also outlined where stereotypical gestural cues are implemented in sound design.